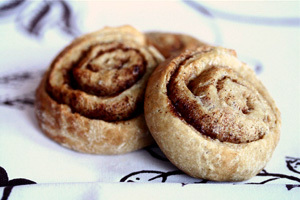 In one of my latest posts on SlashFood, I share my recipe for Sweet Cinnamon Rolls. Many people know that cinnamon comes from the bark of a tree, but there are actually two types of cinnamon bark that we see in this country. The one originating in Ceylon (that’s Sri Lanka now) is called the “true” cinnamon from the ancient world and is still used and cultivated in Mexico. Ceylon cinnamon has a mellow earthy aroma and sweeter taste than the other variety that comes from Indonesia called “cassia”. Ceylon cinnamon happens to be softer in texture as well, and is easily ground. It can even be crumbled easily between your finger tips. Historically, cinnamon is one of the best loved and oldest spices, mentioned in the bible and highly prized in ancient power cultures like Rome and Egypt. It was often used in religious and state rituals, and was also medicinally used. In the ancient science of Ayurveda, cinnamon is considered a “warming” spice that helps raise the body temperature, important to keep sickness at bay in the winter months and maintain metabolism. Cinnamon has a warm, welcoming aroma and is linked to childhood memories for many of us, including baking. Sweeten Your Breakfast Without Sugar: Ground cinnamon has a naturally sweet flavor that is sugar free. Sprinkle it on cooked oatmeal, quinoa, or cream of wheat for a flavorful whole grain breakfast that is sugar free. Make Ordinary Recipes Unique: Cinnamon isn’t just for desserts. I tuck in a cinnamon stick into my taco meat as it’s cooking. Hot and Spicy: Add one cinnamon stick to mulled cider or spiced mulled wine for a luscious earthy flavor. Deodorize Your Kitchen: To rid your kitchen of unpleasant cooking smells, place one stick of cinnamon in a small saucepan with 1/2 lemon or orange. Fill with three cups of water and simmer over low heat 15 to 20 minutes until your kitchen is filled with the aroma of cinnamon. This is a great way to use up a piece of citrus fruit that is past its prime. Cinnamon isn’t Just for Sweets: Many International cuisines, like Mexican, Indian, and Caribbean, use cinnamon in savory dishes. Sprinkle ground cinnamon on baked sweet potatoes, cooked plantains, butternut squash, and steamed carrots. If you love curry, add a sprinkle to your curry spice mix before cooking vegetables and rice. Make a Savory Coconut Curry: Combine 1 can reduced fat coconut milk, 1 tablespoon thai red curry paste, 1 tablespoon soy sauce, 1 tablespoon brown sugar, and a split vanilla bean. Cook over medium high heat until reduced by 1/3. Add 1 pound of peeled de-veined shrimp, and simmer until shrimp are cooked through. Season with a pinch of salt and pepper to taste. Serve with steamed vegetables and brown rice for a quick and complete meal. Learn about the healing properties of herbs from Science Daily. 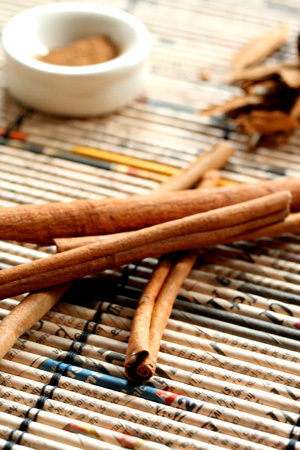 Read more about how cinnamon controls blood sugar from Fit Sugar. I put cinnamon in the coffee grinds when I brew coffee-i figure that since its been found that coffee can raise sugar levels and can contribute to higher colesterol-that adding cinnamon is a good way to balance this out in a really tasty way. Great idea Michelle- and that’s a healthy way to make your own flavored coffee without artificial flavoring. I love cinnamon; I use it in everything from my morning coffee…to my tuna salad sandwich for lunch and broiled chicken dinner…as well as my dark chocolate pudding…Great post! Thanks Jennifer; Happy New Year!